Area: 7531 sq km. Location: Between Ootsa Lake and the Hazelton Mountains, the northern limit being the Morice and Burnie Rivers, the southern limit Eutsuk Lake. Commonly thought of as an inland flank of the Coast Mountains (as are the Hazelton Mountains) but catalogued here as part of the Interior Mountains. 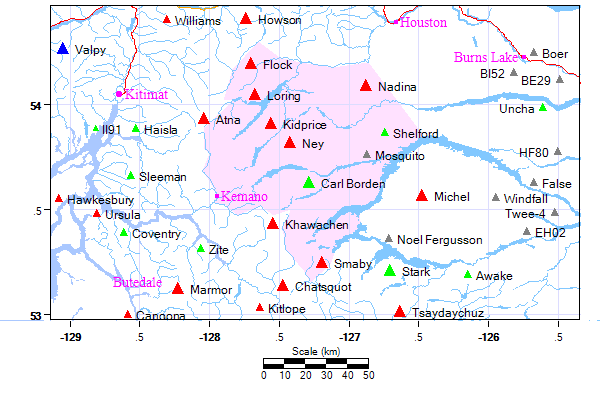 The adjoining Quanchus Range, which lies east of the Whitesail and Chikamin Ranges in the angle of the arms of Ootsa Lake, is formally part of and is charted as part of the Nechako Plateau. The western boundary is arbitrary here but roughly conforms to the Kimsquit, Gamsby, and Kemano Rivers.